Mustard is mostly known for its seeds, which make a great condiment for a variety of dishes; however, the whole mustard plant is not only edible, but also boasts nutritional and medicinal properties. Native to the Mediterranean region of Europe, mustard is thought to be one of the oldest crops of mankind, and has been widely cultivated for over 4,000 years. Many references to this herb can be found in Greek, Roman, Indian, Jewish, and Christian literature. Used extensively for culinary purposes, mustard leaves and seeds are particularly prevalent in Indian cooking to give an extra twist to curry-based stews. Though mustard offers an array of health benefits, its medicinal applications have been less publicized and mostly restricted to folk practices. Relieving pain. The anti-inflammatory properties of mustard seeds have been used since ancient times in folk remedies for the topical treatment of arthritis, foot pain, toothache, lumbago, and rheumatism. Combating infections. The antimicrobial and antiseptic action of mustard's powdered seed has been used to treat a variety of health conditions, from respiratory and dental infections to skin rashes and ulcers. Improving blood circulation. Mustard seed oil is commonly used to massage sore muscles. Mustard has also been traditionally used to rid the body of worms, induce menstruation, and treat scurvy. Protecting from DNA damage. Modern research has found that mustard has an antioxidant action that effectively protects internal organs from oxidative stress, thus helping prevent the development of serious illness. Reducing risk of heart disease. Studies have shown that mustard can effectively regulate the level of triglycerides, the compounds responsible of storing fat in the body. Detoxing the body. Mustard has emetic properties, and has been useful for inducing vomit in cases of acute poisoning, as well as in aversion therapies, such as the treatment of alcoholism. Mustard contains glucosinolates, which are responsible for most of its medicinal actions. These natural antioxidants protect important biomolecules like lipids, proteins, and DNA from damage caused by oxidative stress. Sinigrin is a major glucosinate contained in mustard and other members of the Brassicaceae family. It has shown strong antimicrobial properties, successfully attacking bacteria and fungi. By reducing the level of triglycerides, sinigrin helps prevent overproduction of lipids (fat) after meals (postprandial hypertriglyceridemia), which has been established as an important risk factor for cardiovascular disease, especially in people with obesity and insulin resistance. Sinigrin is also a precursor of allyl isothiocyanate, an organosulfur compound responsible for the pungent taste of mustard. Its rubefacient action promotes vasodilation, thus improving blood circulation. Herbs with analgesic, anti-inflammatory properties are allspice and cloves, whereas honeysuckle and marigold provide antibacterial benefits. Generally considered a very safe herb, mustard may cause allergic reactions in sensitive people. Symptoms of mustard allergy usually appear within minutes and sometimes two hours after ingestion, and they may include skin rash, tingling or itchy feeling in the mouth, swelling in the face, throat, and/or mouth, difficulty breathing, severe asthma, abdominal pain, nausea, and vomiting. Mustard greens are nutrient-rich. 140 grams of mustard leaves provide 60% of the vitamin A (retinol) recommended for the day, completely cover the daily requirement of vitamin C (ascorbic acid), and contribute 50% of daily iron intake. Modern uses of mustard leaves and seeds are generally restricted to the kitchen, as they are popular as a flavoring agent for food. Like any other leafy vegetable, mustard leaves are used raw or cooked in salads, soups, and stews, and the cold-pressed mustard seed oil is occasionally used for cooking and other culinary purposes, such as flavoring curries and vegetables, as well as preserving pickles. When sprouted, the nutritional benefits of mustard are potentiated. Mustard sprouts can be eaten in sandwiches and salads. For treating specific health conditions, it is recommendable to use mustard as a remedy. Dried seeds. 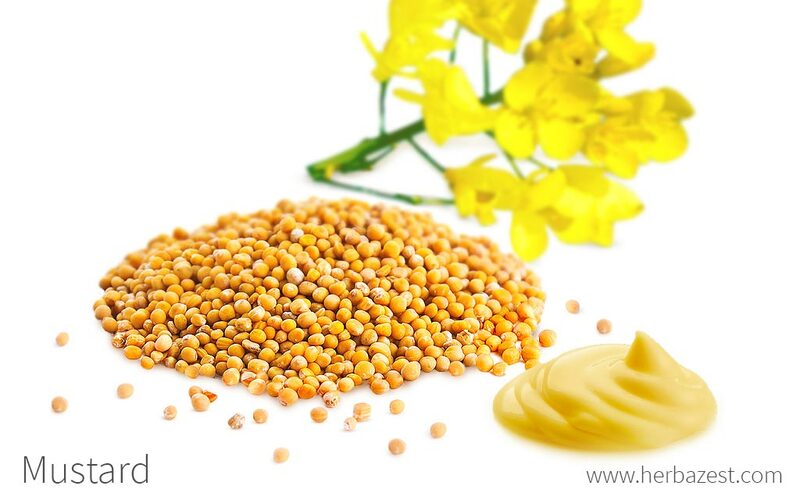 The seeds of mustard have anthelmintic properties and are great to get rid of worm infestations. For treating fever, just soak a full tablespoon of dried mustard seeds in a cup of warm water for about five minutes before consuming it. Poultice. A paste made of previously-soaked mustard seeds can be applied topically, wrapped in a damp, warm flannel cloth, to relieve deep chest colds, toothache, foot pain, and any health conditions involving pain and inflammation. For treating a bee sting, apply hot mustard paste over the stung area. Essential oil. The oil of mustard seeds is used to massage sore muscles, relieve arthritic pain, and increase body heat in winter. Its antiseptic and antimicrobial properties are used for treating superficial wounds and a variety of skin conditions, from acne to chapped lips. Mixed with rock salt, mustard oil is also used to treat gum diseases. Liquid extract. This glycerine-based preparation can be taken diluted in a glass of water or juice every day. It can help soothe arthritis symptoms, ease digestion, and stimulate blood circulation. Tincture. This alcohol-based preparation concentrates the health benefits of mustard, and can provide relief to aching muscles and joints, as well as helping clear air passages. Capsules. Mustard seed capsules can be taken in convenient, fixed doses as a daily supplement to support circulation and digestion. Mustard seeds, both whole and ground, as well as mustard sauces, are not difficult to acquire in most supermarkets and through online retailers, as they are commonly used for gardening and cooking. The actual mustard plant is slightly less common, but still can be found in some plant nurseries and online. Remedial forms of mustard, such as essential oil, tincture, and liquid extract are most likely to be found in specialized herbal stores, and are also readily available for purchase online, where also mustard capsules can be found in various brands and concentrations. Mustard grows in both tropical and subtropical regions as a winter crop, but it also does well in temperate climates. Mustard plants are particularly sensitive to damage from excessive moisture, and they will do best under certain conditions. Mustard plants will thrive as long as they are planted in well-drained, fertile soil that is high in organic matter, with pH 6.0 - 7.5. Mustard seeds are generally sown during spring and then harvested towards the end of summer. The seeds must be planted about one inch (2.5 cm) apart, and once they have sprouted, the seedlings need to be separated so they are six inches (15 cm) apart. The seeds need two inches (5 cm) of water per week and will take 3 - 10 days to germinate. Mustard plants are likely to flower early if exposed to warm conditions, but this results in poorer seed results, so keeping to the normal flowering cycle is recommended. Mustard seeds are normally 0.04-0.08 inches (1 -2 mm) in diameter. They differ in color depending on which plants they come from, ranging from light yellow to black. Mustard species (Brassica spp.) are part of the Brassicaceae family, which also includes cruciferous vegetables such as cabbage (Brassica oleracea var. capitata), Brussels sprouts, and broccoli (Brassica oleracea), as well as other species with great medicinal benefits, like maca (Lepidium meyenii), nasturtium (Tropaeolum majus), and woad (Isatis tinctoria). The genus Brassica comprises over 150 species of great economic importance; however, the most commercialized mustard species are three: yellow or white (Brassica hirta or Sinapis alba), brown or oriental (Brassica juncea), and black (Brassica nigra). Purple mustards. They can be grown in a container or mixed into flowerbeds among winter annuals. Curly leaf mustard greens. These are the ones found most often in the grocery store. They can be slightly bitter, but combining them with turnip greens or collard greens helps soften the flavor a bit. Oriental mustards. These varieties have a mild flavor and are great sautéed and added to salads. Tendergreen. A hybrid of spinach and mustard, it has the sweetness of spinach and a bit of mustard pungency. Lacey mustards. Though edible, these are mainly ornamental mustards, which come in a red or green color and look great in gardens. Cultivars of some mustard species have been developed for oil, seasoning, and fodder, such as 'Pacific Gold', which is very similar to the oriental mustard cultivar 'Cutlass' but with a stronger pungency; 'IdaGold', a cultivar of yellow mustard; and 'Kodiak', which is derived from brown mustard. Mustard plants have been cultivated by millennia, and ancient Egyptians, Greeks, and Romans used mustard to treat inflammatory diseases, such as arthritis and rheumatism, as well as for culinary purposes. THE ORIGIN OF THE NAME “MUSTARD” CAN BE TRACED TO THE 12TH CENTURY, WHEN BRASSICA SEEDS WERE MIXED WITH MUSTUM, WHICH IS THE LATIN WORD FOR UNFERMENTED GRAPE. In 1814, an English flour miller called Jeremiah Colman sold mustard powder for the first time. By 1830, Colman's mustard made its way to the United States, where it was originally used on fast food served at baseball stadiums, such as sandwiches, hotdogs, and hamburgers. Later on, mustard gained popularity as a condiment for salad dressings, marinades, and barbecue sauces. The mustard seed industry produces over 600,000 metric tons annually, and the largest mustard producer is Canada, followed by Nepal and Ukraine. All three of the most commercialized mustard species (black, brown, and yellow) are currently being grown in North America. The French people hold the highest rate of mustard consumption, with an average of 1.5 pounds (680 g) per person annually, and buy around 70% of the Canadian production every year.